Traditional villages in the Southern Moravia region of the Czech Republic are characterized by their distinctive urban planning. The streets are lined with L-shaped row houses neighboring each other on narrow rectangular plots, each with its own long and narrow backyard. A single multi-generational family home typically consists of three parts: the street-facing house inhabited by parents with their children, a home for the grandparents bordering on a courtyard, and the remaining lot to the rear of the property which was traditionally used for small-scale farming. In general, the front-facing houses are more spacious and feature more elaborate construction techniques. The façade, for example, the house’s public presentation to the neighborhood, is plastered and colored in light natural tones. The rear buildings, however, typically remain unplastered, as such a solution was an unnecessary expense. 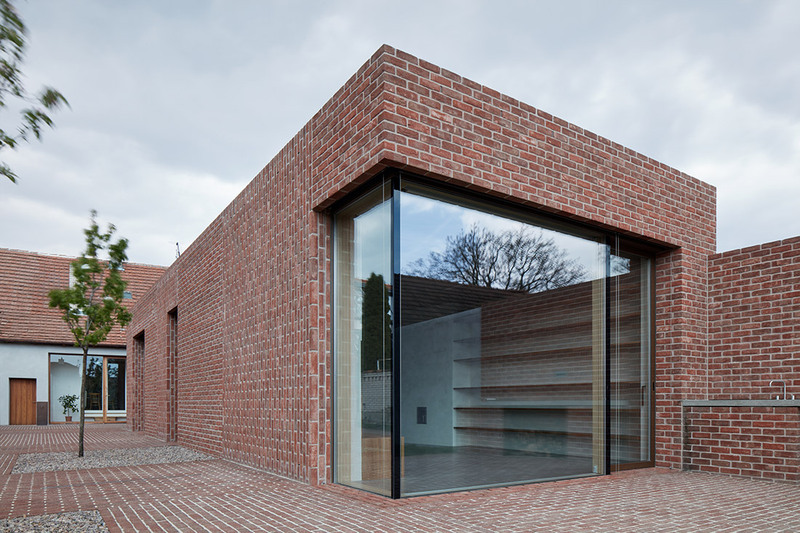 The use of exposed brick architecture for the rear buildings was a simple, durable, and cost-effective solution which nonetheless radiated familiarity and warmth. I decided to respect this tradition in my plans, using bricks for the construction in the rear of the property. The building is long and narrow, conforming to the historical shape of the lot. However, I departed from tradition on one point, in terms of structural planning: whereas a typical house would be one elongated L-shaped structure, I decided to detach the existing front-facing house from the new addition. 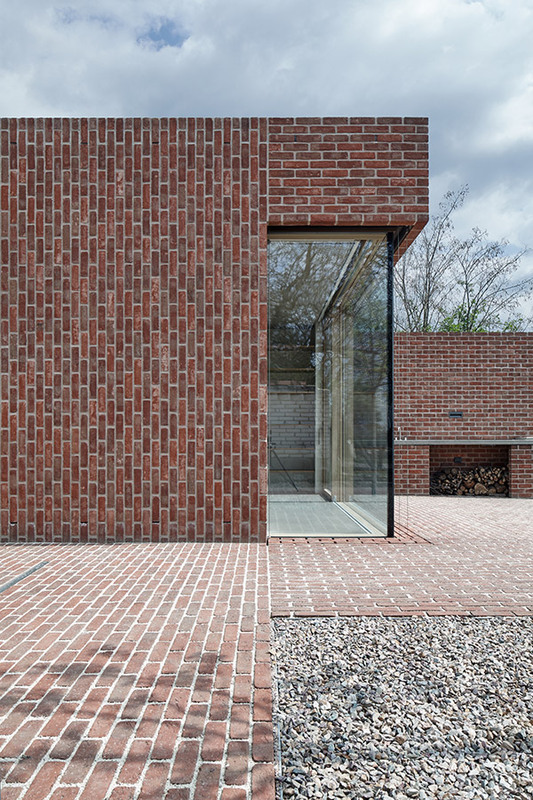 Both houses thus retain their individual identity. 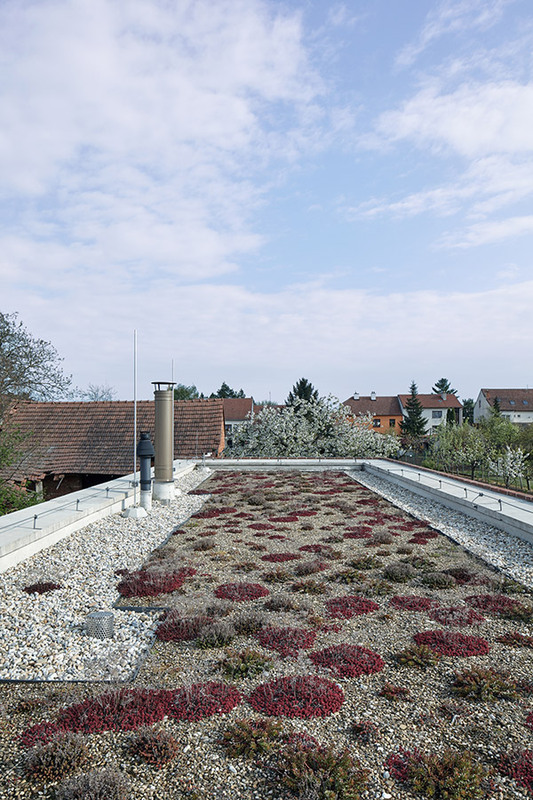 The flat roof further emphasizes the simple elegance of the new structure. It evokes and celebrates the perpendicularity of the property, as if the façade itself were an additional property-line fence. 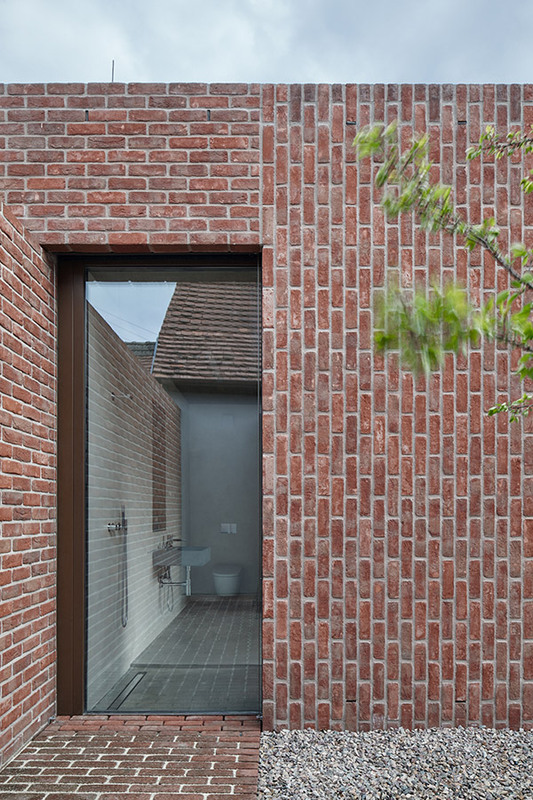 The exposed-brick façade, spilling over into an exposed-brick courtyard, also defines the boundary of the backyard garden. The single-floor floor plan is very simple and functional. The main room features an open kitchen and a large table, abutting in a non-frame sliding window with views on the garden. Adjacent, there is a bedroom with a narrow bathroom. With this construction, it was my aim to create a modest yet fully-functional living. A house in a traditional Southern Moravian village, reflecting elements of the local style, built as an extension of an existing third-generation family home. 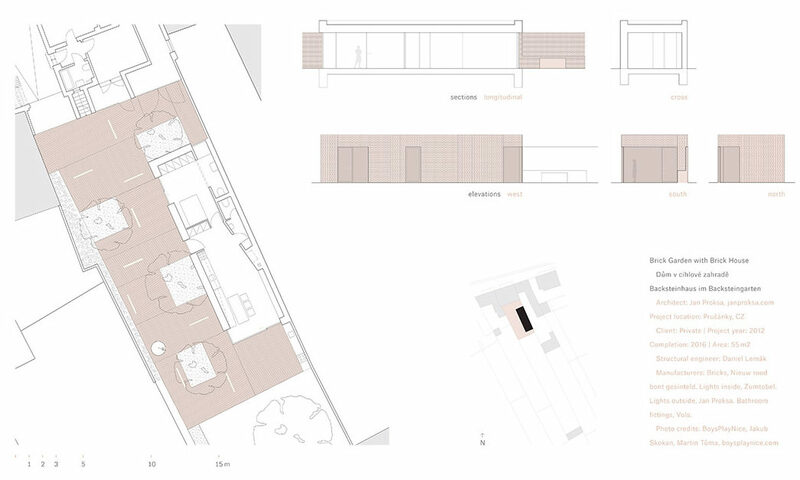 The internal rooms and external kitchen and courtyard together form a fluid and unified living space. 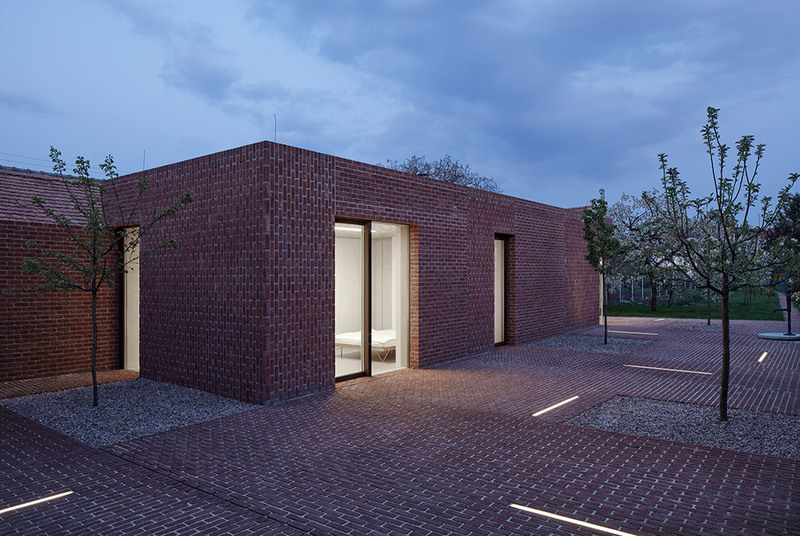 This continuity is reinforced by the use of locally-sourced traditional brick for both the tree-lined courtyard and the building’s façade. 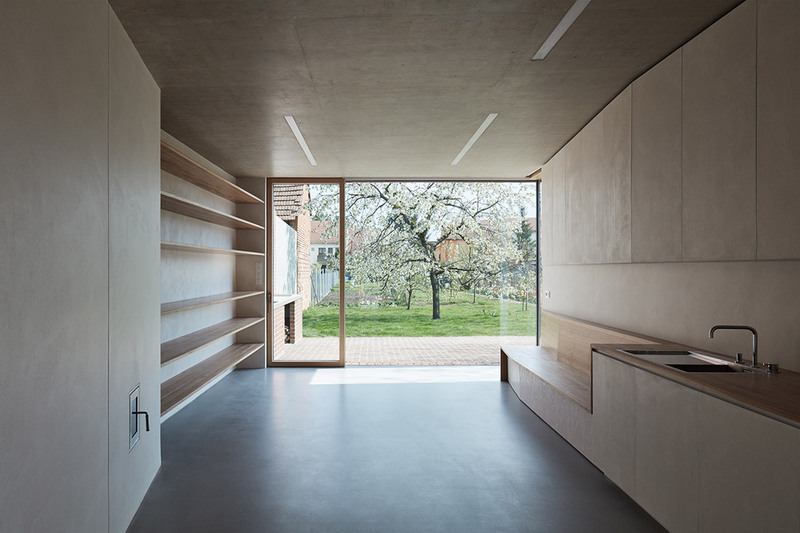 The single-floor planning of the house is minimal and open, inviting functionality.